It's sad that Levin’s achievements as a writer have been so underplayed. He was not a prolific novelist by any standard, much less the standards of genre fiction (he published only seven books between 1953 and 1997 and this may be part of the reason for his low profile), but he was a master not just at thinking up highly suspenseful plots but also at the art of maintaining suspense over the course of a book. His writing style, functional though it appears to be, conceals a delicate craftsmanship, especially in the way he accumulates little details and uses them to create menace. This means that though all his books contain a frisson-generating twist (or a few minor twists and one major surprise), most of them survive multiple readings. It’s possible to revisit them even after their secrets have been digested. 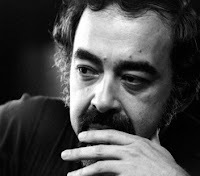 My favourite among his books is probably The Boys from Brazil, and I remember that it took a while for me to sink into it the first time around. The opening chapter, with its series of quotidian details, can try the patience of a reader who expects a thriller to supply facile thrills right from the first page. A private plane touches down at Sao Paulo airport, three men – one in a white suit, the focus of our attention – emerge and drive to a Japanese restaurant where a room has been reserved for a party. Once inside, they set about examining every corner of the room, our only indication that something suspicious is afoot. Then the other guests arrive, the men exchange greetings in Portuguese and Spanish but switch to German as they begin to converse more freely; they banter, allude to old times. Food is served; they flirt with waitresses. All these details are presented in staccato sentences that gradually build layers of tension; we sense that this is leading up to something bigger. Soon enough, the men get down to business and we learn that this is a meeting of former Nazis presided over by Josef Mengele (a real-life physician known as the Angel of Death for his medical experiments in concentration camps), its agenda being that 94 men – all civil servants, all 65 years old, living in different parts of the world – have to be killed on specified dates in the next two years. These killings, Mengele says, without providing his accomplices (and the reader) any further explanation, will help fulfill a plan to “restore the supremacy of the Aryan race”. Levin’s skill here as elsewhere lies in presenting facts passively, as if by a less-than-omniscient narrator who doesn't know anything about the characters' motivations but is simply recording their movements; he slowly brings together the elements of a scene before revealing their full implications and pulling the carpet out from beneath the reader’s feet. (This is why the most apt jacket description I’ve read on a Levin novel – on an edition of Rosemary’s Baby – simply goes: “The young couple. The new neighbors. The suicide. The amulet. The doctor. The herbs. The anagram. The baby.”) Another good example of this occurs later in the book, when Yakov Liebermann, an aging Jew who has dedicated his life to tracing fugitive Nazis, realises what Mengele’s true motives are. Levin doesn’t immediately tell us about Liebermann’s realisation: instead he describes his movements – staring silently at his food, excusing himself from the table, going into the next room – from the perspective of his dining companions. One of them looks through a doorway, sees Liebermann “standing in profile, head bent to an open book, rocking slightly”, and wonders if this is a case of a “Jew at prayer”. This is rich imagery, for when Libermann returns we discover that what he was looking at wasn’t a prayer-book (sorry, no spoilers), and the reason for the swaying is that he was in a state of shock. Levin’s few stylistic experiments work very well too, because he uses them with discernment – for instance, there’s a passage where Liebermann, while giving a speech about the Holocaust to a group of young German students, decides to pick their brains for the solution to the “why are these 94 men to be killed” question. At a couple of points in this chapter – often right in the middle of an exchange between Liebermann and a student – Levin cuts to a very brief description of one of Mengele’s assassins carrying out a killing. The effect of this sudden break on the unprepared reader is difficult to describe – you really have to experience it for yourself (the first time I read it, I wondered if there was a printing problem in my copy of the book). Speaking in cinematic terms, it isn’t so much like cross-cutting as introducing an unrelated, two-second visual in the middle of a scene to unsettle the viewer. Here, it adds urgency to the narrative, reminds us that even while these discussions are taking place in this closed hall, Mengele’s plot is being put into practice and time is running out. It’s very effective. 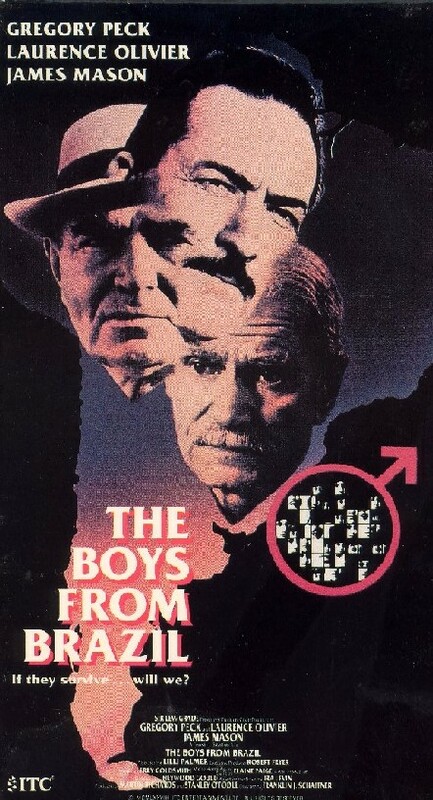 At the heart of The Boys from Brazil is a premise out of science-fiction (though one that’s less likely to be considered science-fiction today than it was in the mid-1970s), and this, along with the demands of the genre, means that the reader is required to suspend disbelief. But Liebermann (memorably played by Olivier in the 1978 movie version) is a completely believable protagonist, one we can whole-heartedly engage with, even without the knowledge that he’s based on the real-life Nazi-hunter Simon Wiesenthal. This is a persistent, slightly crabby old man, constantly aware he is short on time and resources, and that many people, some of them Jews, look at him with bemusement. He has mood swings: he’s saddened by how little the Holocaust means to modern young people (struggling to conceal his shock when an otherwise sympathetic girl unthinkingly refers to Mengele’s work at Auschwitz as “research”) but also encouraged by the support he receives from unexpected quarters; and, at the end of the novel, he’s still optimistic enough about the human spirit to make a generous decision. 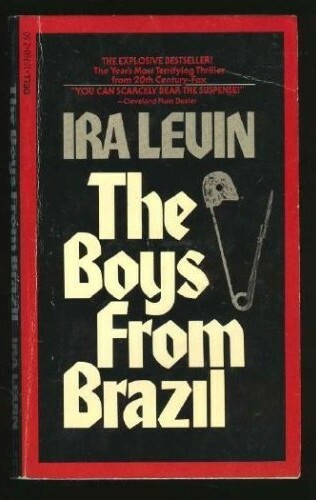 He’s a character we can genuinely care about, and this, along with Levin’s eye for detail, for a gesture that can acquire retrospective significance, gives The Boys from Brazil a staying power that many other suspense novels lack. I watched Boys of Brazil when it was shown on Star Movies, way back in 1998 and Rosemary's baby and Stepford Wives much later. I read Levin only after watching the movie adaptation. 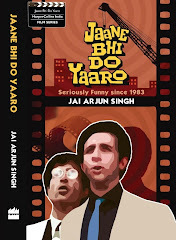 I felt his books were written directly for the screen. You have captured mostly everything I felt about Levin's novels. Thanks for the post. Good to know you appreciate Levin. Wow...Levin sounds like a filmmaker's dream author, as far as desciptive screenplay is concerned. I enjoyed Pradeep's eulogy, written in the master craftsman's style itself.